What Is the Nutritional Value of an Apple? What Vitamins Are in Raspberries? While oranges' origin remains elusive -- they might have been native to India or China, notes Purdue University -- they're now widely available throughout the United States, and make up one of the world's most popular fruit crops. Each cup of orange sections contains 85 calories, so oranges can help keep you feeling energized between meals without spoiling your appetite. They also offer several nutritional advantages because of their vitamin and carbohydrate content, although they also have some drawbacks. Oranges offer some advantages by boosting your intake of healthful carbohydrates. Each cup of orange sections offers 21.4 grams of total carbohydrates, with 16.9 grams coming from natural sugar. These carbs fuel your muscles, and also provide energy your body needs to maintain your metabolism, control your body temperature and support brain function. 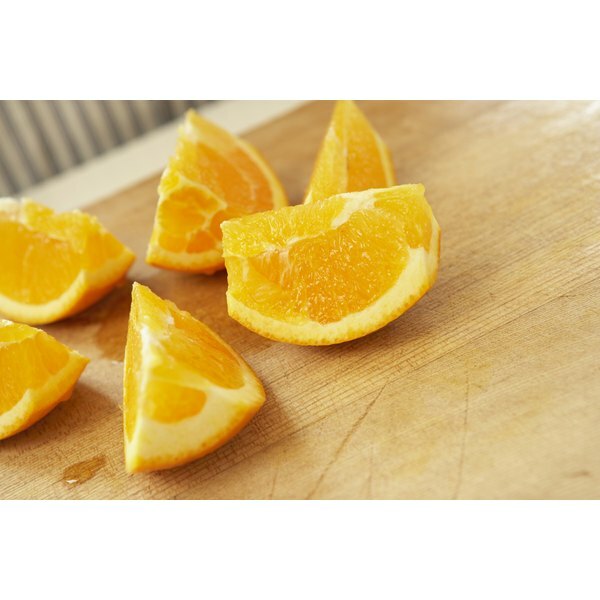 A cup of orange sections also provides 4.4 grams of fiber, a type of carbohydrate not converted into energy. Fiber instead lowers your cholesterol, combats digestive disorders such as constipation, and prevents coronary artery disease. A single serving of orange slices provides 12 percent of the fiber intake recommended daily for men and 18 percent for women. Oranges also contain a significant amount of thiamine, or vitamin B-1. The vitamin B-1 in your diet activates enzymes essential for a healthy metabolism, and, as a result, it helps you derive energy from fats and carbohydrates. Low vitamin B-1 levels negatively affect several organ systems, including your skin, cardiovascular system and nervous system. Snacking on a cup of orange slices increases your vitamin B-1 intake by 185 micrograms, which is 15 percent of the recommended daily thiamin intake for men and 17 percent for women. Oranges also make advantageous additions to your diet because they're rich in vitamins A and C. Both of these vitamins support the health of your skin -- vitamin C activates enzymes needed to synthesize collagen, a protein that strengthens your skin, while vitamin A aids in skin cell growth. Each 1-cup portion of orange slices contains 416 international units of vitamin A, and contributes 14 percent toward the daily vitamin A needs for men and 18 percent for women. A serving of orange slices also contains 83.2 milligrams of vitamin C -- more than the 75 or 90 milligrams needed by women and men daily, respectively. Despite their beneficial nutrient content, oranges have some drawbacks. Like other citrus fruits, oranges are high in acid. Exposure to acid softens and erodes your tooth enamel, increasing your risk of tooth decay over time. Citrus fruits are among the most harmful foods for your oral health, notes Tufts Journal. Citrus fruits, including oranges, can also trigger allergic reactions -- the University of Colorado lists citrus fruits as one of the "nasty nine" culprits likely to be responsible for allergies. What Are the Benefits of Apples, Oranges & Grapes?